While some NASA scientists work to capture and explore an asteroid, other NASA scientists are calculating how to target and collide with an asteroid, running hypervelocity impact simulations that could one day change a potentially hazardous asteroid’s orbit. Like many of his colleagues at NASA’s Jet Propulsion Laboratory, Pasadena, California, Shyam Bhaskaran is working a lot with asteroids these days. And also like many of his colleagues, the deep space navigator devotes a great deal of time to crafting, and contemplating, computer-generated 3-D models of these intriguing nomads of the solar system. But while many of his coworkers are calculating asteroids’ past, present and future locations in the cosmos, zapping them with the world’s most massive radar dishes, or considering how to rendezvous and perhaps even gently nudge an asteroid into lunar orbit, Bhaskaran thinks about how to collide with one. The term hypervelocity usually refers to something traveling at very high speed — two miles per second (6,700 mph / 11,000 kilometers per hour) or above. Bhaskaran’s hypothetical impacts tend to be well above. “Most of the hypervelocity impact scenarios that I simulate have spacecraft/asteroid closure rates of around eight miles a second, 30,000 miles per hour [about 48,000 kilometers per hour],” said Bhaskaran. In the majority of our solar system, where yield signs and “right of way” statutes have yet to find widespread support, hypervelocity impacts between objects happen all the time. But all that primordial violence usually goes unnoticed here on Earth, and almost never receives scientific scrutiny. Hypervelocity impacts by spacecraft are not just a hypothetical exercise. Scientists have taken the opportunity to analyze data from used spacecraft and rocket stages that have impacted the moon and other celestial bodies since the Apollo program. 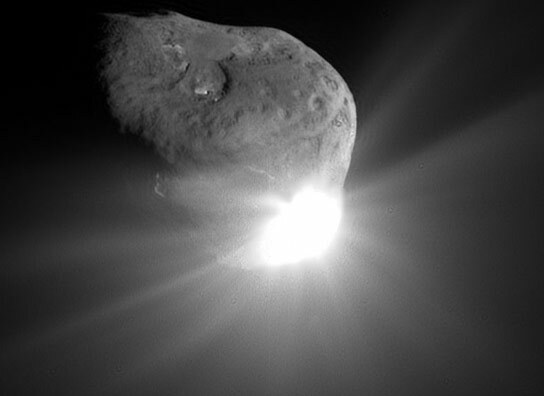 On July 4, 2005, NASA’s Deep Impact spacecraft successfully collided its dynamic impactor with comet 9P/Tempel 1 — it was the first hypervelocity impact of a primitive solar system body. Along with the size of the celestial body being targeted, Bhaskaran also has to take into account its orbit, targeting errors, how hard an impact the scientists want, and even the shape. The guidance system Bhaskaran is referring to is called “AutoNav,” which stands for Autonomous Navigation. To reach out and touch something that could be halfway across the solar system and traveling at hypervelocity requires a fast-thinking and fast-maneuvering spacecraft. It is a problem that even the speed of light cannot cure. “When it comes to these high-speed impact scenarios, the best info you get on where you are and where you need to be comes very late in the game,” said Bhaskaran. “That’s why the last few hours before impact are so critical. We need to execute some final rocket burns, called Impactor Targeting Maneuvers (ITMs), quickly. With Earth so far away, there is no chance to send new commands in time. Currently, Bhaskaran is running simulations that make his virtual impactor go splat against the furrowed, organic-rich regolith of asteroid 1999 RQ36. The 1,600-foot-wide (500-meter-wide) space rock is the target of a proposed JPL mission called the Impactor for Surface and Interior Science (ISIS). The impactor spacecraft, which looks a little like a rocket-powered wedding ring, would hitch a free ride into space aboard the rocket carrying NASA’s InSight mission to Mars. The impactor’s trajectory would then loop around Mars and bear down on RQ36. The part of the ISIS mission Bhaskaran is most interested in is what happens after our rocket-festooned, cyber-hero rounds Mars and begins to close the distance with the asteroid at a speed of 8.4 miles per second (49,000 kilometers per hour). Over the next several months, the mission navigators would plan and execute several deep space maneuvers that refine the spacecraft’s approach. Then, with only two hours to go, AutoNav would take over to make the final orbital changes. While Bhaskaran loves ISIS for the navigation challenge it provides, the proposed mission’s principal investigator likes what the out-of-this-world equivalent of the release of nine tons of TNT does to the surface — and interior — of an asteroid. The data would not only provide information on what makes up the asteroid, but how its orbit reacts to being hit by a NASA spacecraft. Which leads us back to Bhaskaran and his hard drive laden full of hypervelocity impact simulations. Bhaskaran will present his latest findings on guidance for hypervelocity impacts on Tuesday, April 16, at the International Academy of Astronautics’ Planetary Defense Conference in Flagstaff, Arizona. NASA detects, tracks and characterizes asteroids and comets passing relatively close to Earth using both ground- and space-based telescopes. The Near-Earth Object Observations Program, commonly called “Spaceguard,” discovers these objects, characterizes a subset of them, and predicts their paths to determine if any could be potentially hazardous to our planet. JPL manages the Near-Earth Object Program Office for NASA’s Science Mission Directorate in Washington. Steve Chesley of JPL is leading the Impactor for Surface and Interior Science (ISIS) mission proposal. JPL is a division of the California Institute of Technology in Pasadena. NASA’s Goddard Space Flight Center, Greenbelt, Maryland, manages the OSIRIS-Rex project. Be the first to comment on "How to Target and Collide With a Potentially Hazardous Asteroid"